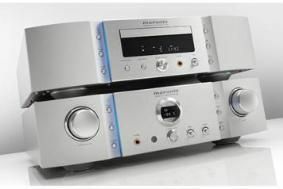 Marantz introduces Series Two midrange SACD player/amp pairing | What Hi-Fi? The SACD player is completely different from the original model, says Marantz, and incorporates lessons learnt from the company's flagship £5000 SA-7S1 model. At the heart of the SA-15S2 is Marantz's proprietary SACDM-10 mechanism with an extruded aluminium case and ultra-stiff Xyron disc tray, both designed to minimise vibrations when a disc is playing. The SACDM-10 mechanism feeds a Cirrus Logic CS4398 24-bit/192kHz digital-to-analogue converter. Under the lid you'll also find bespoke electrolytic, thick film capacitors, Shottky diodes and Marantz's SA-2 Hyper Dynamic Amplifier Modules (HDAM). The latter replace single chip, off-the-shelf op-amps and are said to provide superior performance, as does the high-quality power supply. There are two sound filter options for CD and SACD replay, and a 'display off' function to further enhance performance. The SA-15S2 is designed to partner the matching PM-15S2 amplifier. It delivers 200W per channel, uses HDAM-SA2 and -SA3 modules and is fitted with an MM/MC phono stage. A Power Amp Direct mode enables the SA-15S2 to be used as part of a multichannel set-up. When switched on, the Power Amp Direct mode uses the power amp section to drive the front left and right speakers within a multichannel system, while the surround channels can be driven by an AV receiver. Alternatively, it can be used to biamp a traditional stereo hi-fi system. Both the SA-15S2 and PM-15S2 are available now.